What is it about the sea that draws us to it over again? We can lose ourselves within its power but find ourselves all at the same time. 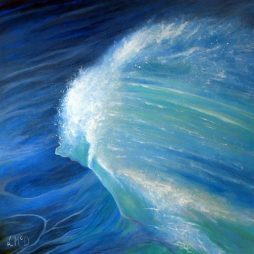 To watch a wave crashing is a reminder that we are miniscule in the midst of nature. We are but mere mortals yet the incessant movement of the sea has been and will always be here. 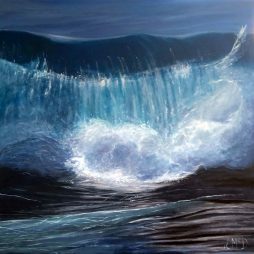 Living in a 200 year old cottage overlooking the sea in Caithness, in the far north of Scotland, Lisa does not have far to venture to gather inspiration for her original oil paintings. Lisa witnesses first-hand the many changing moods and seasons of the sea. Living and breathing the sea and living in such close proximity to it allows her to truly study the movement and light of waves as they crash on the shore below her house. Lisa has been painting professionally for 10 years. Initially, after university, she followed a corporate path into project management, but realised that she had so much more to offer the world in terms of her creativity, so in 2009 she gave up all mortgage ties and regular income to follow her creative passions. That path lead her to Scotland in 2011 and she has never looked back. She now runs a successful creative business, but as the business grew Lisa needed an outlet for her pure creativity and a way to express her love of the sea. 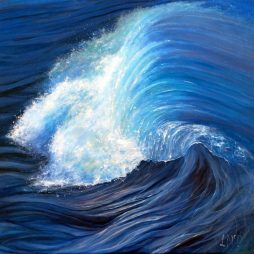 Lisa believes in the healing, calming, restoring and replenishing power of the sea having witnessed over and again the ability it has to bring people back to themselves. 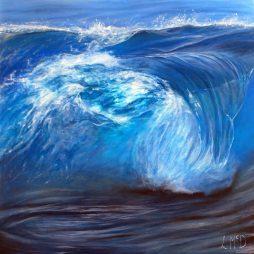 She hopes that her paintings will have the same effect on people as she endeavours to capture the ever changing beauty, grace and dance of the sea.